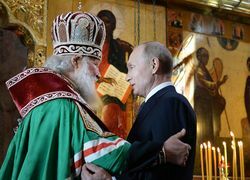 Moscow, May 7, Interfax - Patriarch Kirill of Moscow and All Russia led a thanksgiving service to mark President Vladimir Putin's inauguration on Monday. 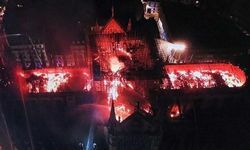 Following the presidential inauguration ceremony, Putin went to the Kremlin's Annunciation Cathedral, at the entrance to which the patriarch was waiting for him. They went into the church together. The prayers contained a request the God give the president "strength and wisdom to rule the country, creating peace and well-being in it." At the end of the service, Patriarch Kirill chanted a prayer traditionally used in this church service: "Make him wise and direct him to perform this great service without any impediments." After this, the patriarch told Putin on behalf of clergy, monks, and believers that all these people supported Putin, seeing him as "not only as a leader who successfully rules the country, but also as a man faithful to the fatherland" and as a person "for whom the spiritual tradition is his own tradition, for whom the material and spiritual well-being of people is the goal of his presidential term." The patriarch wished the president strength and health to fulfill all of the pledges he gave in his inauguration speech. As a gift from members of the Russian Orthodox Church's Holy Synod, the patriarch presented Putin with the 18th-century icon of the Savior from the patriarch's sacristy. This icon reflects "the beautiful and spiritual tradition" of the Russian people, the patriarch said. Before leaving the church, Putin venerated the church's icon of the Annunciation of Our Mother of God. This is Patriarch Kirill's second church service on the occasion of a presidential inauguration. The tradition of holding a service "for the beginning of a good undertaking" was originated by the late Patriarch Alexy II, the predecessor of Patriarch Kirill, who performed thanksgiving services in 2000, 2004, and 2008. This is Putin's fourth such service.